Practicality has no place in fashion nowadays. We’re the generation obsessed with oversized fits, super-long sleeves and sneakers so bulky they weigh our feet down. Once reserved for pensioners with back pain and middle-aged men on mountain hikes, these fashionable styles are now a staple part of every streetwear obsessives’ wardrobe. We have Raf Simons to thank for that first step. 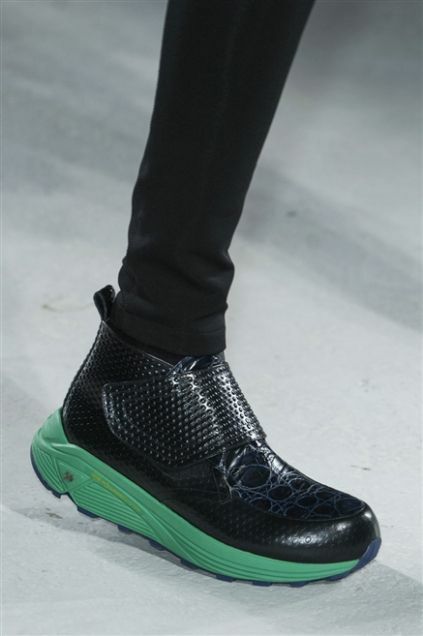 Raf’s pioneering reboot of the classic Ozweego silhouette by adidas turned everybody’s heads when it bowed during his FW13 collection: a garish, split sole running shoe crafted with a fetish-like mix of leather, mesh and silicone. In the modern renaissance of the ugly sneaker, it’s the OG style, and despite their divisiveness, their rough-diamond beauty causes them to sell out every drop. It would go on to lead to the revival of the bulky and ostentatious sneaker: Reebok killed it with the Insta Pump Fury, linking up with Vetements for a killer collaboration or two, while Balenciaga’s Triple S became last season’s must-have. But while sneakerheads’ love for the Ozweego is definitely something that a niche age group appreciates, a strange thing stemmed from fashion’s proud obsession with challenging, and perhaps “ugly” design. Once relegated to the shoe racks of your dad and his mountaineering buddies from work, an innovative sole from Vibram – the Italian pioneers of hiking-friendly sole engineering – began making waves among tastemakers. It’s not the most likely of transitions. After all, images of brown, beat-up mountaineering shoes are regularly used as laughable examples of what style shouldn’t be, but there’s something about one of their creations that has managed to permeate even the most inscrutable of inner fashion circles. The RollinGait system, ergonomically designed with the structure of a car or bike tire in mind, is a sole that curves with the foot to stop shock on impact. Comprised of two pieces – an outsole and a midsole – the pair combine to help mountain hikers with their downhill descent, moving in tandem with their foot so that muscle fatigue, for them, becomes a thing of the past. It screams out “substance over style,” but the RollinGait sole has gained a following outside its traditional outdoor sports audience thanks to the audacity of its design. Looking like something you might see on a Digimon character, the sole mixes its ergonomic purpose with a striking, jagged futuristic moulding. When applied to whatever upper it’s paired with (and trust us, the options seem endless), it demands attention; you’ll rarely see a RollinGait shoe that isn’t defined by the sole itself. The RollinGait sole permeating high fashion isn’t necessarily something we can credit to the revival of runner-style sneakers. In fact, back in February 2014, the RollinGait broke out on the runway in a silhouette more suited to ballroom dinners than the streets. For his FW14 menswear showcase, the infamous designer and former creative director of Dior, John Galliano, presented a collection inspired by technical sportswear and cycling gear. On the feet of each of his models? Oxford and Wallabee-esque dress shoes, with dyed leathers, perforated uppers and a customized RollinGait sole, each presented with either flashy orange, blue, or dusty pink accents. Although a low-key moment in the runway calendar (Galliano has failed to have a powerful impact on fashion since he was fired from Dior for anti-semitic remarks back in 2011), it subtly signaled the transition of this dad-friendly sole into a footwear style worth flexing. All the while, brands like Hi-Tec were still using the RollinGait sole for its original purpose, releasing chunky brown hiking books that optimized the climber-friendly component, but still ventured out into the distinctly cooler world of runner-style sneakers too. Hi-Tec’s popular Silver Shadow silhouette – a simple runner, comprised of suede and mesh panelling with a reflective “swoosh-like” element too, was given a cockier “RGS” reboot. It might just be one element, but the inclusion of the Vibram-born sole turned the style around. It goes from a subtle style you could pick up from a discount sneaker retailer to a loud, proud silhouette that sold out when it hit shelves. Hi-Tec had gone hi-fashion. Since then, brands like Sweden’s Our Legacy and Amsterdam’s ETQ have found the right to reclaim this practical creation from the hands of its makers. Those worried about the wearability of the style might be worried about how it fares on the feet of those used to less overbearing silhouettes, but when the Swedish design team over at Our Legacy got their hands on it, the styles associated with Vibram’s invention became altogether more classy. 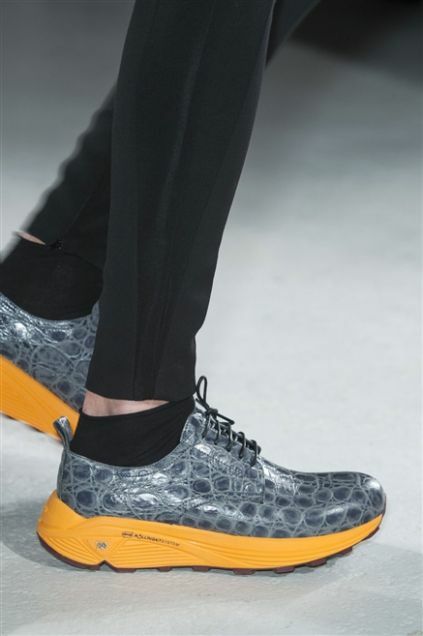 For relatively smaller, emerging names who may not have the resources to develop their own sole or cushioning technology like Nike’s LunarLon or adidas’s Boost, Vibram is helping brands from all over the world compete in the global footwear market. But the seal of approval from a creative polymath like Virgil Abloh is the real sign that the Italian sole-makers have cracked it. For their Fall 2017 collection, Virgil’s OFF-WHITE unveiled a set of runner-style sneakers boasting the brand’s iconic four arrow emblem. The sole? Of course, a Vibram creation. His version of the RollinGait-blessed sneaker doesn’t stray too far from the styles produced by the minimalist European streetwear brands we mentioned earlier, with its mix of suede upper and leather heel accents – it’s a modest, monochrome marvel. Imagine that: even in the hands of a master like Virgil Abloh, the RollinGait does so much talking that it feels like sacrilege to try and distract you from its innovative style. Who would have thought that the team behind an orthopedic-friendly, hiking boot sole would find love on the elegant Parisian runways?